Friends of Newberrry Hill Heritage Park is a 501c(3) public charity. Donations to our organization are tax deductible and used to maintain the park and fund projects appropriate to the long range objectives for development of the park. We work closely with Kitsap County Parks and the Newberry Hill Stewardship Group. The Stewards are mentors and act as the co-ordinating body for all park projects, and supply labor to implement projects. All projects are proposed, until and when approved by Kitsap County Parks. As Friends and Stewards, we apply the long range guiding principles established by stakeholders to everything we do. 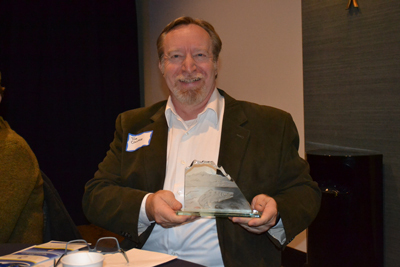 Steward president Tom Coleman with the Hood Canal Coordinating Council Award for Environmental Achievment. It is an honor to win this award and made more so by the calibre of those that were nominated but did not win.